The Punjabi Prison surrounded the ring as WWE Champion Jinder Mahal [w /Singh Brothers] came down to the ring and announced that this will end up as the final resting place for Randy Orton this Sunday at Battleground. The brothers explained the rules of the contest and then Mahal re-iterated that despite these rules, there will be "no rules" and it will be no holds barred. Mahal promised to hit Orton with the Khallas from the top of the prison to the mat before walking out as champion. He then proceeded to repeat his words in Punjabi but Orton&apos;s music interrupted him. Surprisingly, Orton simply emanated from the entrance and said that Mahal is either the bravest or dumbest man that he&apos;s ever met. Orton said that the Singhs are the only reason that he now holds the championship and reminds Jinder that this stipulation will nullify that advantage. Orton noted that he has nothing to lose at this point while Jinder could lose everything in return. Randy sat on top of the outer part of the prison and promised that this would be his view when he wins his title back this Sunday. Orton posed while Mahal and his entourage stewed in the ring. 1) Jimmy Uso [w /Jey Uso] (Tag Team Champions) def. Kofi Kingston [w /New Day] by pinfall in 8:35 when he reversed a flying cross-body. Shane McMahon met with the ladies in the 5-way elimination match at Battleground and after the women fought over who would get to face Lana (except for Tamina, who seems to be her guardian angel now). Natalya suggested Charlotte and Becky face each other though so Shane made it official. A pre-recorded interview with Chad Gable was shown in which Gable said he was very taken back with the revelation of Jason Jordan being Kurt Angle&apos;s son and the fact that he will be on RAW now. Gable said that he would support Jordan in anything he does and said that he would have some surprises in store for the WWE Universe. 2) Mike Kanellis [w /Maria] vs. Sami Zayn in 3 minutes when he hit a Samoan Driver following a distraction by Maria. John Cena came down to the ring to address the Flag match against Rusev this Sunday at Battleground. He cut a patriotic promo about standing up for the USA but then Rusev attacked him from behind and locked him in the Accolade. Cena tried to fight out of it but Rusev was relentless and eventually rendered his opponent unconscious. Shinsuke Nakamura told AJ Styles that he will one day answer his US Open Challenge. Natalya joins the announce table for color commentary. 3) Becky Lynch vs. Charlotte Flair by submission in 8:59 when she locked on the Dis-Arm-Her. After the match, they were both jumped by Lana, Natalya & Tamina. Nattie was then taken down by the other two. Women&apos;s Champion Naomi promised that even though she isn&apos;t wrestling at Battleground, she will be the first to congratulate the winner of the 5-way elimination match. 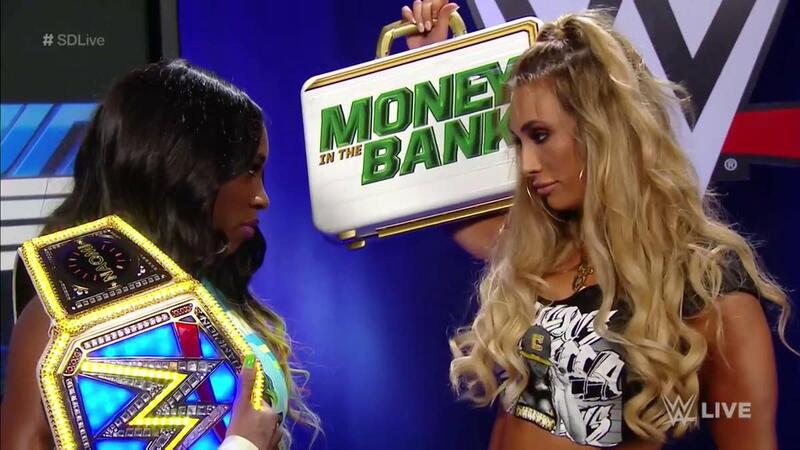 Carmella then interrupted and reminded her that she will always be right behind her. Breezango continued the search or who trashed their office in an episode of The Fashion X-Files. They thought they heard a ghost but it was just Aiden English warming up his vocal chords. They saw a light and a "green man" who was merely a delivery man that turned on the light so he could see around. Fandango then reached into the box and pulled out Tully the horse&apos;s head. There was a note that simply said "Battleground." 4) Baron Corbin & Kevin Owens def. United States Champion AJ Styles & Shinsuke Nakamura by pinfall in 9:04 when Owens hit Styles with the Pop-Up Powerbomb.